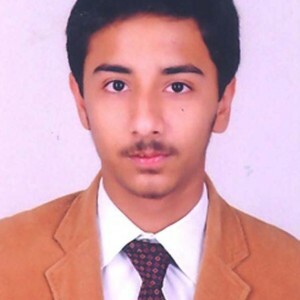 Hi guys, after covering 7 sure shot question from Maths and Chemistry to come in JEE 2018 I am back with yet another blog. 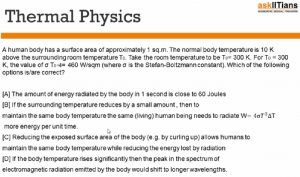 And this time its turn to tell 7 sure shot questions of Physics that will come in JEE 2018. 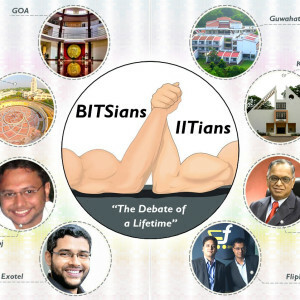 I remember that my last two blogs were on the webinars taken by our experts and telling you about the important chapters, their important concepts, how these topics have appeared in past few years JEE exams both Mains & Advanced and the type of question that can be asked from it. Well, this time as well we will be following the same pattern but with a bit of surprise at the end. 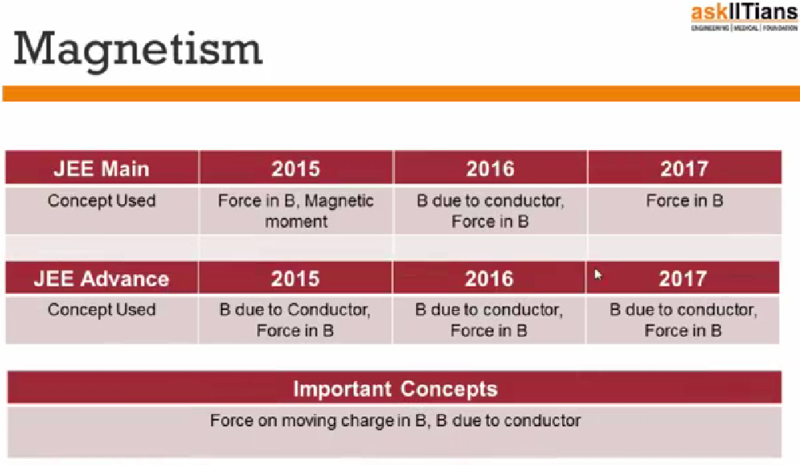 The Physics webinar was taken by our Physics expert Mr. Abhilash Sharma (IIT-Madras). Now for those who missed the webinar, I have shared its video as well. 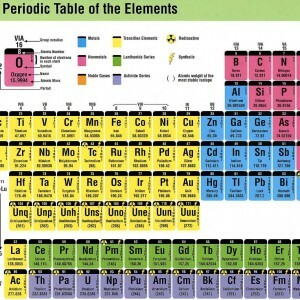 But for your quick reference, you can still go through the blog. 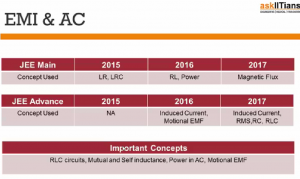 The first topics covered here is Semiconductor Devices, now here what you need to consider is that questions from transistor characteristics (graphs) are common in JEE. As per the analysis done by our experts, there are very high chances of a question from “Logic Gates” to come in JEE 2018. Below is how the important topics have featured in past few years JEE exams. 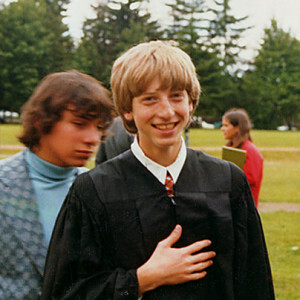 The thing to keep in mind is that they will either ask question from communication part (Semiconductor) or core electronics. Both of are not included in the same paper. 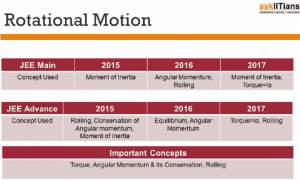 In Rotational Motion the most commonly appearing topic is ‘Angular Momentum’. 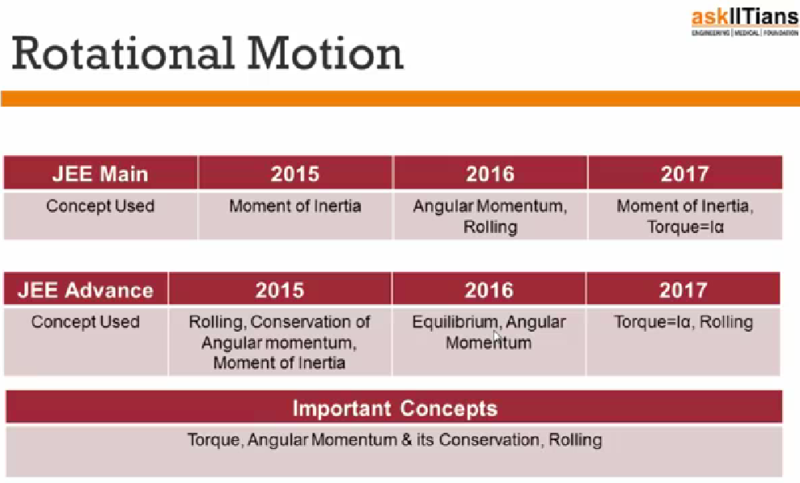 From this, question from Angular Momentum & Rolling concept has high chances to come in JEE Mains while question from Conversation of Angular Momentum has high chances to come in JEE Advanced 2018. 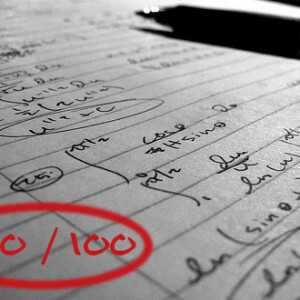 Below is the analysis of how it has been covered in past in JEE exams. 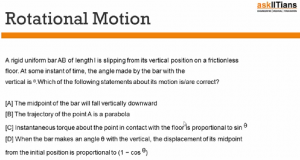 The question type that can come in this is as follows. Thermal Physics has two important topics that have been covered constantly since past 3yrs in JEE Mains and Advanced respectively. 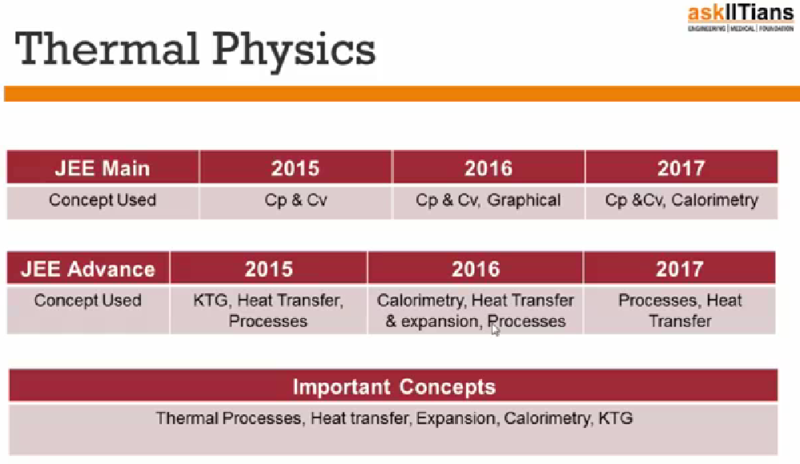 In JEE Mains, Relation of Cp & Cv has been coming constantly since past 3yrs and Heat Transfer in JEE Advanced since past 3yrs. 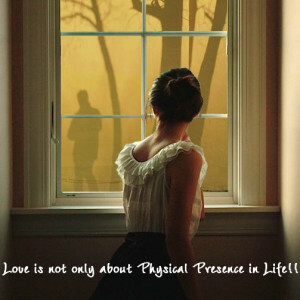 Below is how it has been covered in past and other important concepts as well. 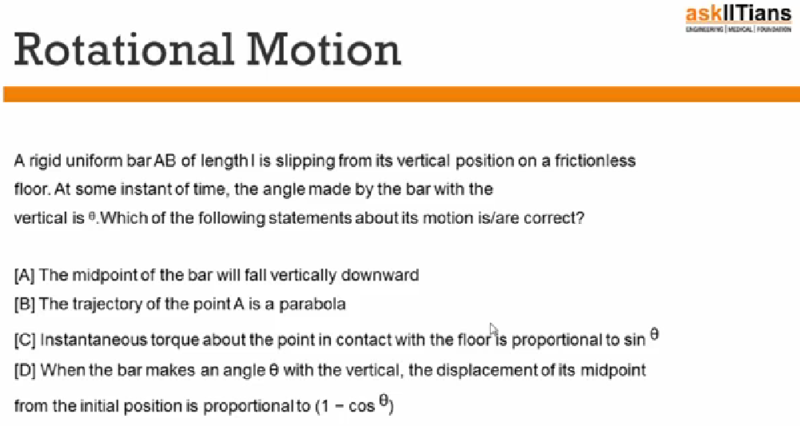 The question type covered under it is as follows. 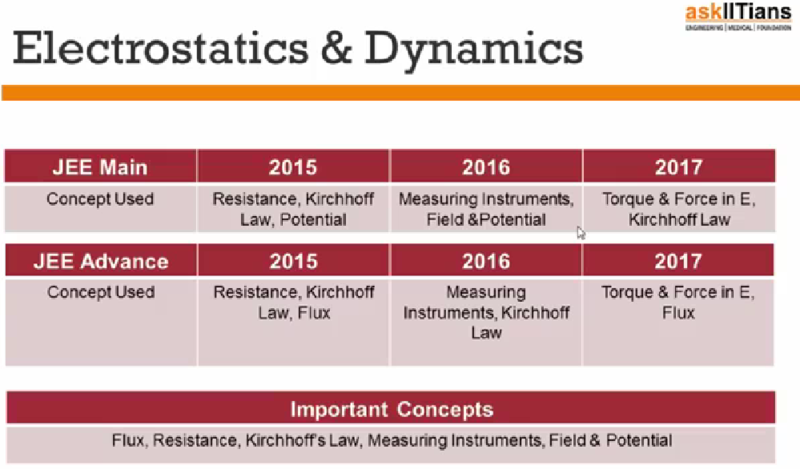 Under these topics, Electrostatics mainly covers Field & Potential and Dynamics mainly covers Current Electricity. 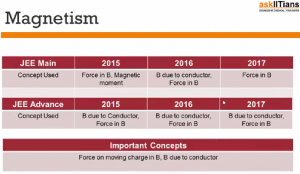 If JEE Mains is considered then ‘Kirchhoff’s Law’ is most frequently appearing topic. 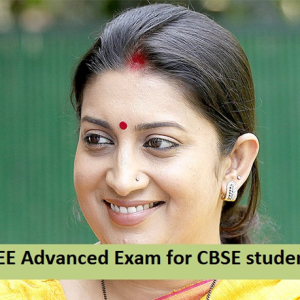 In case of JEE Advanced, Flux is highly favoured topic and has a high possibility of coming. Below is how it has been covered in past few years. The type of question that can come under this is as follows. 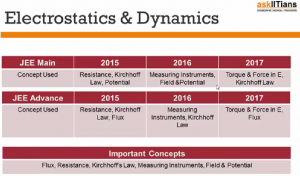 In JEE Mains apart from Kirchhoff’s Law, one question from measuring instruments has high possibility of coming. If you consider the type of question that comes in JEE Advanced this topics has followed a common pattern in past few years. 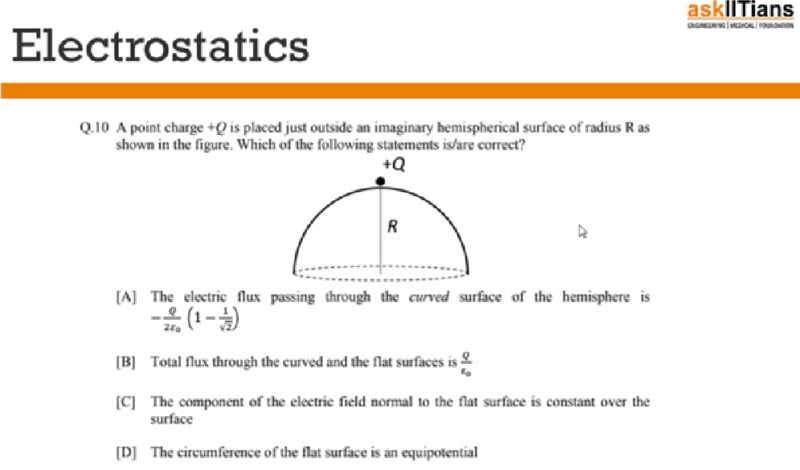 The question from ‘Magnetic field in a shape’ has been constantly appearing in past few years JEE exam. Below is the analysis of how it has appeared in past. 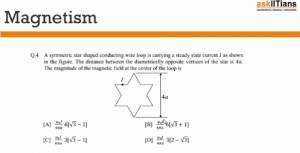 This year as well there is a high possibility of question to calculate Magnetic field from a network (shape). 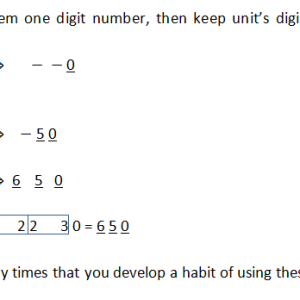 And an example of question type is as follows. 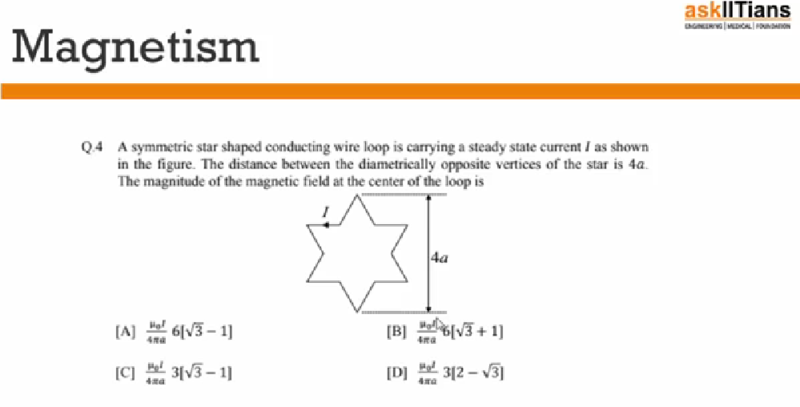 Apart from this a comprehension type question to find the path of charge also has a high possibility of being asked. 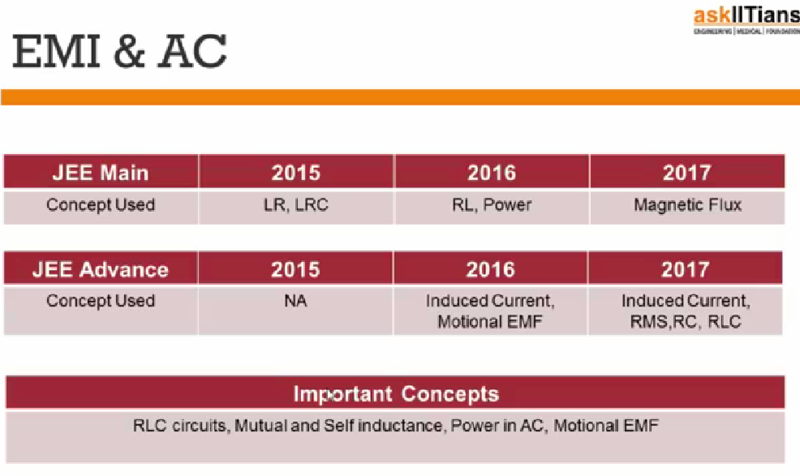 From Electromagnetic Induction and Alternating Currents, the common question that comes in JEE Mains and Advanced is from RLC (Resistor-Inductor-Capacitor). 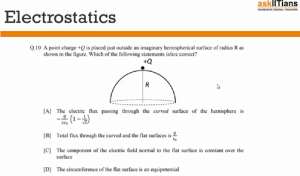 Question from this topics comes either in JEE Mains or JEE Advanced. Below is the presentation of how it has been covered so far. 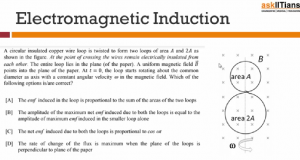 However, this time question from EMF (Electromotive Force) is most likely to come in JEE 2018. 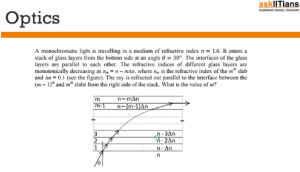 From Optics, YDSE (Youngs Double Slit Experiment) is a common topic that comes in both JEE Mains and Advanced. Apart from this Prism is also a favoured in both Mains as well as Advanced. Below is how it has come in past few years. 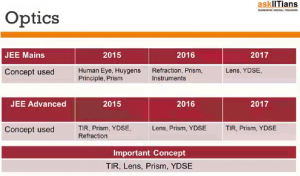 The question type that can under from Optics is as follows. 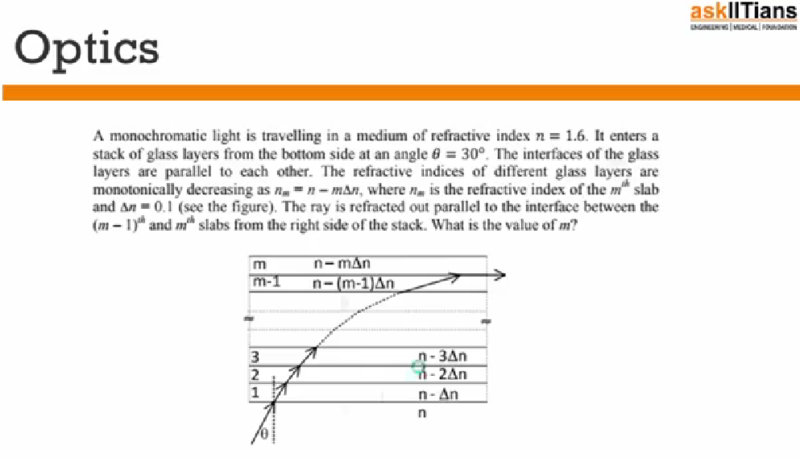 As per our analysis, a question from YDSE, Prism and TIR (Total Internal Reflection) is most likely to come in either JEE Mains or Advanced. 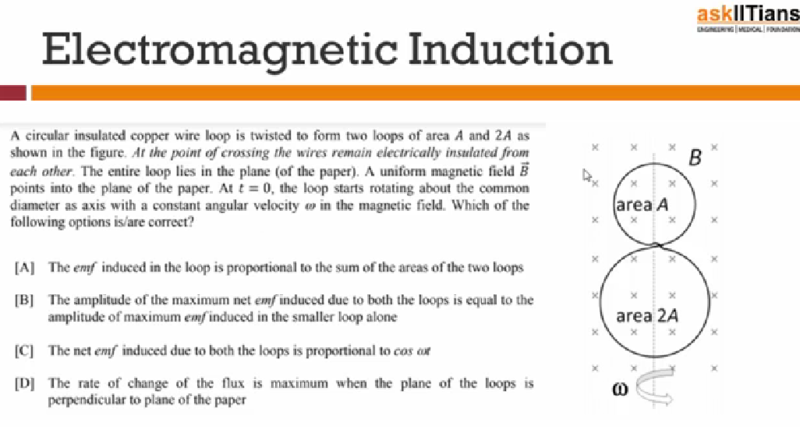 Well, in the beginning of this webinar I told you that there is a surprise for you all and the surprise is that this time we have covered one more topic that is most likely to come in JEE Mains and Advanced. Apart from the ones mentioned above ‘Modern Physics’ also has high possibility of coming in JEE Mains and Advanced. 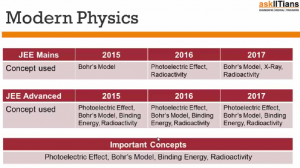 Questions from Photoelectric effect or mixed questions from Bohr’s Model and Photoelectric Effect are most likely to come. Below is its analysis of how it has come in past. 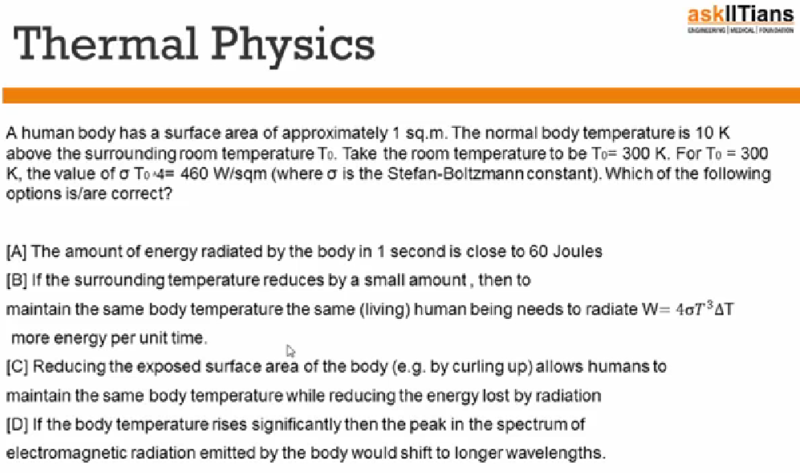 Guys, kindly note that Physics has a great possibility of different types of questions under each topic. 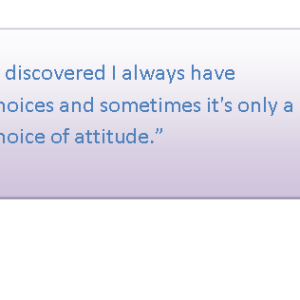 The above mentioned questions are examples of what type of questions can come. 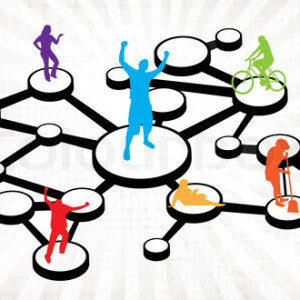 And this is surely not the end, we will be back with more such interesting and informative webinars and blogs in future. Till then, this is me Abhishek saying GOODBYE and stay tuned.